The great sequoia or redwood trees that grow in California are among the most famous in the world and James Rumford’s artwork in this marvellous book certainly does them justice, evoking their height and majesty as they dwarf the contemporary family who have stopped their car to admire them. But where did their name come from? In his afterword, Rumford makes a plausible case for the trees being named after Sequoyah (1760/65-1843), the Cherokee Indian who invented a writing system for the Cherokee language. That connection is how the narrative is borne out here, as the father tells his children the story of the man behind their name. Sequoyah’s achievement was huge, and like so many innovative processes, not at first appreciated by his peers: in fact, his first efforts to give the language a written form were derided and his house was burned down. Instead of giving up, however, he took this as a chance to step back, reassess, and move away from trying to come up with a different symbol for every word. Instead, he invented a syllabary – 84 symbols representing the different syllables in the Cherokee language. 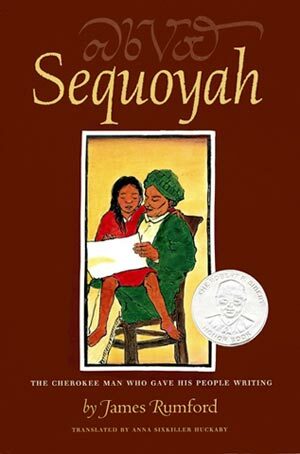 After people saw Sequoyah’s daughter reading (shown in the cover illustration), they embraced their written language: I love the topsy-turvy yet enriching idea here that ‘People took trips so they could have the fun of writing letters and sending them back home’. Sequoya is a beautifully constructed book – as with his other books, Rumford has extended the storyline into how he went about the artwork, so here he has painted and drawn over wood to add texture and the nuance of the trees. The style of the illustrations very much echoes woodblock printing, and indeed Rumford names Japanese artist Hiroshige (1797-1858) as one of the artists he turned to ‘to solve the complex issues of color and composition in “tall” pictures’ – the other two being Navaho artist Quincy Tahoma (1920-1956), and contemporary Chinese artist He Jiaying. Each image contains a word in Cherokee, translated in the front matter, and Anna Sixkiller Huckaby’s translation into Cherokee adds further beauty as well as being an integral part of what the book communicates. A syllabary at the end with English transliterations will allow young readers, unfamiliar with the language, to explore the Cherokee text a bit for themselves and maybe even try some writing. Read my 2011 interview with James Rumford. 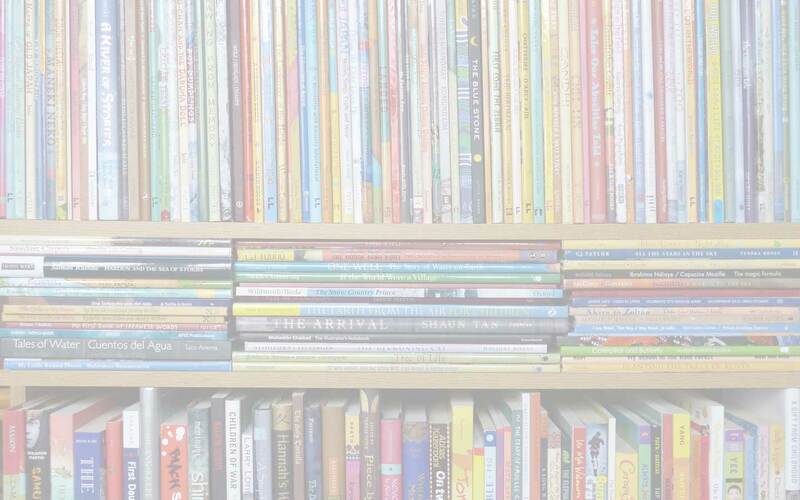 'Branching Across the World: Trees in Multicultural Children's Literature, Houghton Mifflin, James Rumford, MWD book reviews, picture-book biographies, Sequoyah. Bookmark.